Camping options are becoming ever more flexible, adaptable and expandable; no longer are we limited to a standard motorhome or caravan, in fact why settle for one of those when you could have a 100 square foot expanding cabin? Or this expandable apartment that fits inside a van? Or why not transform your existing truck into a camper by simply raising the roof? This is the concept behind the TopperLift kit from TopperEZLift, a 12V lifting system which attaches to the back section of your truck and transforms it into a pop-up camper. A truck, a tent and a camper van all in one. The TopperLift uses a relatively uncomplicated system of zip-able canvas walls, insulation and actuators powered by the truck’s 12V battery, to create a space just big enough to sleep two people. 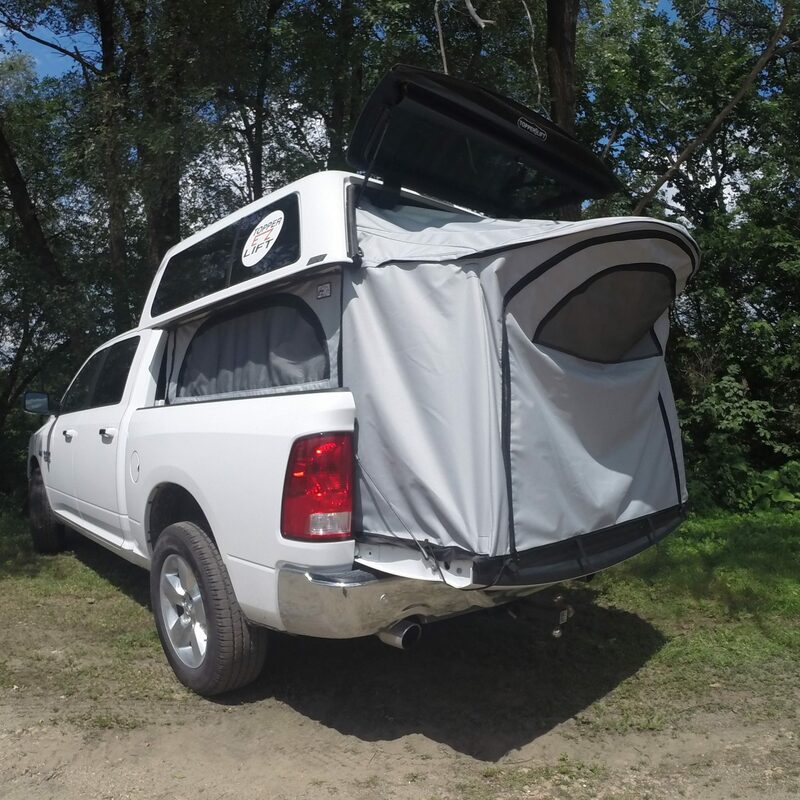 It fits all full- and mid-size pick-up trucks, can be self-installed, and can be used to extend the space in the back of any truck to create a perfect mini getaway for fishing, hunting and camping trips. The 5ft x 8ft space of a typical truck bed is raised an additional 17.5 inches by the EZ Lift system, creating ample headroom and foot space with the addition of a canvas extension that hangs over the truck’s tailgate. There’s not a great deal of room for cooking or lounging indoors, but for two people to sleep it’s an ideal size, and the installer even has the option of building a platform below the sleeping space for storage. A full size sleeping space is created with the additional room of the tailgate. Insulation packages are available, as is carpet, and mesh windows attached with High Temp Adhesive Velcro for keeping cool; it all depends on which package best suits your needs. The Weekender package includes three side panels and a dome tent-style extension which hangs over the truck’s tailgate to increase sleeping space, while the Contractor package is designed with workers in mind. It creates an elevating box compartment for grabbing tools from the sides of the truck, and canvas sides which sit within the confines of the truck and can be un-velcroed, rolled up and stowed away when not needed. Additionally, TopperEZLift also sells an optional installation tool kit to make things easy, but the whole kit can be installed with just a handful of basic tools. TopperEZLift have also begun taking pre-orders for their new package called the Nomad Camper; it’s a little like the Weekender, but doesn’t require a TopperLift to raise the roof. It’s like a tent inside a pick-up truck, and will begin shipping in January. TopperEZLift’s new Nomad package, as seen on two different types of truck. The main element of the lifting system itself is two powerful actuators bolted into the truck’s roof and floor, wired directly to the truck’s battery and operated by a safety switch and control box. They can lift 900 pounds up to a height of 17.5”, creating a space that is almost 5ft high inside, just tall enough to crouch or sit with the addition of a mattress. The truck’s roof is raised, and the canvas sides are pulled up to create an instant tent-like structure with a zippered entrance. The sides are made from heavy duty material, and are available in either grey or tan. A demonstration of the TopperEZLift Weekender package being set up. 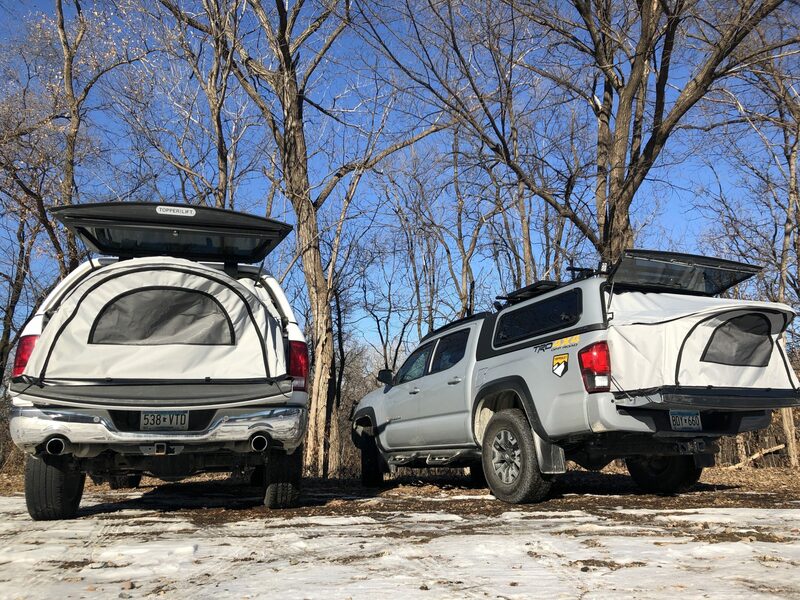 Pick-up trucks being arguably the most popular vehicle across the U.S., the TopperEZLift kits are sure to tempt a few avid campers away from the confines of a typical camper van, and at a fraction of the price too. The Weekend and Contractor packages are both retailing for $1,995, but a standalone lifting kit is also available for just $1,195, and the Nomad package will be less again at just $345- clearly TopperEZLift know their market. Sure, you don’t get all the commodities and comforts you would get with a camper van, but when it’s just you, the stars, a roaring campfire and a comfy bed, what more do you really need on a camping trip?